As a lover of fantasy I’m often drawn to stories built on a foundation of lore, myth, and history. If a fantasy is good, I feel immersed and intrigued. The story should feel as though it operates within a functional, developed environment. To accomplish this, many authors write lore and legend to give their fantasy world some context. Some allow the readers to experience this lore; some choose to keep it a secret. I work with the former idea. What is the best way to import lore and legend into your fantasy story? Fool around with the frame narrative. The frame narrative model employs a very specific structure: telling a story within another story, and possibly within another story, and so on. In theory, there is no limit to the number of frames your story might have. The outer frame is the “story” which you the author are writing. The next frame might be a story that your protagonist is telling to a group of friends. The NEXT frame might be a story that the protagonist of your protagonist’s story is telling to a group of coworkers. And so it goes. The reason for the name is very simple: if you were to “map” this story, you would draw something along the lines of a picture frame within a picture frame within a picture frame. Each story has it’s own realm within which it works and functions, but it also holds a relationship with the frame within which it nests and the frame nested within. 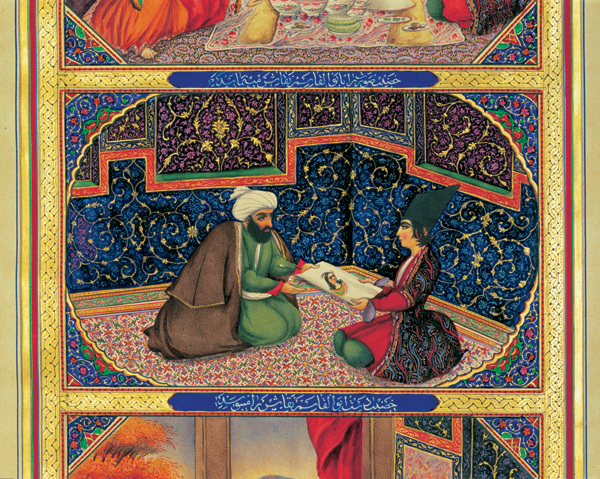 An early example, One Thousand and One Nights also known as the Arabian Nights, includes a frame narrative in which numerous stories (in some versions totaling the full 1,001) are nested. The main frame involves the execution of a King’s wife over her infidelity. In his anger, the King decides to marry a virgin every night and kill her in the morning before she can be unfaithful to him. The man responsible for supplying the women is unable to further provide virgins, so his own daughter volunteers. On the first night she tells the King a story (a 2nd frame) but ends it on a cliffhanger, explaining that she will continue the story the next night. This goes on for the duration. The frame structure in this instance is quite successful and very meta-fiction: it supplies the reader with fictional myths derived in real influences for One Thousand and One Nights and it places them within the experience of oral storytelling. Rather than the author or narrator tell the reader the story of of “The Fisherman and the Jinni”, the King’s new wife tells it to them. This changes the perception of the story and the user experience. It calls attention to the art of story telling in the process. Although One Thousand and One Nights does not employ the stories for the sake of delivering back story, it’s model is just as efficient in illustrating the structure. In my in-progress-novel, I considered with a skeptical mind the notion of showing vs. telling. I wanted to reveal magical histories from an ancient tome which only revealed its pages to those of the purest mind and intention. On the one hand, showing scenes in a flashback seemed like a waste of time and space; I didn’t want to take the readers far from the current predicament. On the other hand, just telling back story took a lot of luster out of the narrative I had in mind. So I opted for the frame story. I had my protagonist read from the tome, playing with her voice and the reader’s perception of her character to define how the histories presented themselves. This adds a level of depth and authenticity to the world my characters are living in. My readers will be reading a book, a story. So will my characters. Every world has its lore and legend and every lore and legend has it’s own style, syntax, and means of expression. As a writer, playing within a new frame gives opportunity to expand upon and explore one’s own techniques. If done correctly, it allows the reader to explore even more fantastical worlds and settings, adding to immersion and experience.